Many of the reforms that were so effective in Michigan are included in Gov. Bruce Rauner’s legislative agenda for Illinois. Illinois and Michigan have traded places on two key metrics for measuring prosperity and opportunity, and both changes are embarrassing for the Land of Lincoln. 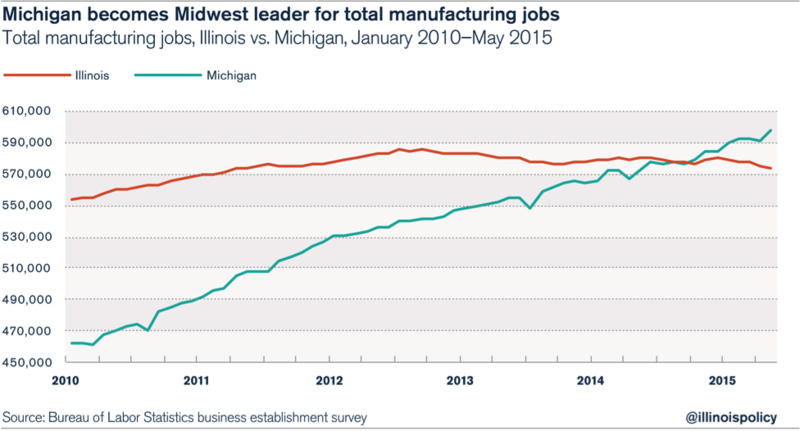 The first major change came in October 2014, when Michigan surpassed Illinois for total factory jobs. Michigan now has 25,000 more factory jobs than Illinois even though the Wolverine State’s economy is only three-quarters the size of Illinois’. Now, new data from the Department of Human Services shows the embarrassing role reversal has come full turn. In March of this year, Illinois bumped off Michigan to become the Midwest’s No. 1 user of the Supplemental Nutrition Assistance Program, commonly known as food stamps. 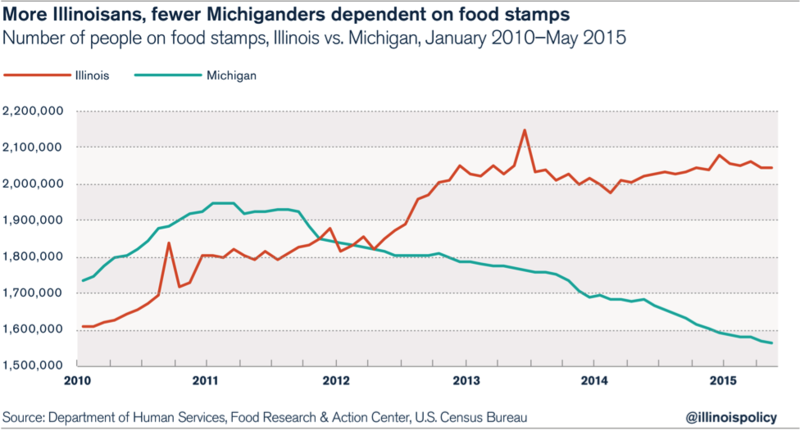 For the past several years, Michigan had a higher percentage of its residents on food stamps than any other Midwest state. But not anymore. 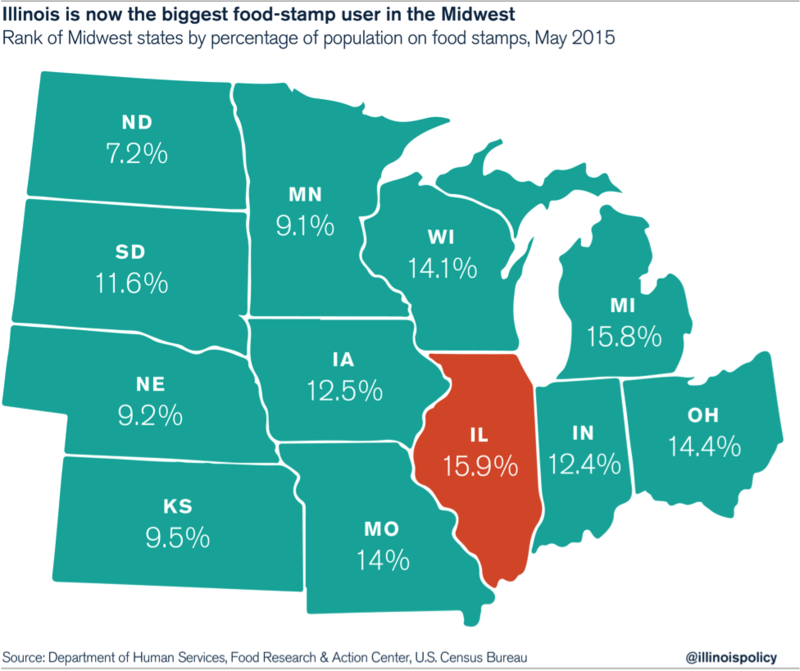 Illinois now has a higher portion of its population on food stamps than any state in the Midwest. This change was a long time in the making. Back in January 2010, near the bottom of the Great Recession, Illinois had only 12.5 percent of its population on food stamps, while 17.5 percent of Michiganders depended on the federal program to put food on the table. In the meantime, the number of Illinoisans on food stamps has climbed by 435,000, while the number of Michiganders dependent on food stamps has fallen by 170,000. Michigan’s declining food-stamp rolls have coincided with its rising economy, and in particular the resurgence of Michigan manufacturing. Since the recession bottom, Michigan has added 157,000 manufacturing jobs, compared to Illinois’ paltry addition of 19,000 factory jobs in the same period. Like the state’s ongoing budget issues, Illinois’ persistent food-stamp problem will not go away without economic growth. That means more Illinoisans waking up to head to a factory job instead of being forced to trek to a welfare agency. Right now, Illinois is headed in the wrong direction. What is so timely about the news of Michigan’s ongoing revival is that many of the reforms that were so effective in Michigan are included in Gov. Bruce Rauner’s legislative agenda for Illinois. Michigan enacted collective-bargaining reforms along with Right to Work, and is currently working on repealing its prevailing-wage law. Michigan’s workers’ compensation system is in line with Indiana’s and far more competitive than Illinois’. And Michigan property taxes are, on average, $750 per year lower than Illinois’. Given the successful turnaround that is occurring right next door, it’s no wonder Rauner wants to take a few pages out of the Michigan playbook, and leverage them to spur a comeback in Illinois.